So many topics, so little time. Over the past few weeks I have encountered many interesting topics that might intrigue you – here are five. Africa is Much Larger Than I Thought. Because my family traveled so much when I was a little guy, I have always had an interest in geography. But recently I learned something new about Africa that still amazes me even as I write this. A few weeks ago we were in the Cayman Islands and visited our daughter Alie’s friends, Bridget and Richard. While they live in the Cayman Islands, they had just returned from South Africa. At one point Richard said to me, “Do you know that Africa is larger than the United States, Mexico, China, India, and most of Europe combined?” All I could say was, “no way.” We then pulled-up this visual exhibit from the Economist on our phones, which is very cool. Of course, I had to verify the information and looked-up the square miles of each and, sure enough, they all fit. Did you know this? Bridget and Richard explained to me that our common misconception is partially caused by the fact that most of the world maps we grew-up with are out of proportion – early cartographers enlarged northern areas because most of the map purchasers were from the northern hemispheres and wanted to understand their home areas better. Deeds of Land in a Cereal Box. While it is not as common today, for many decades cereal companies included toys and other surprises in cereal boxes to sell cereal. Recently I read about the most unusual promotion ever – deeds of land. In 1955 the Quaker Oats Company launched the Klondike Big Inch Land Promotion to sell Quaker Oats puffed-wheat and puffed-rice cereal. 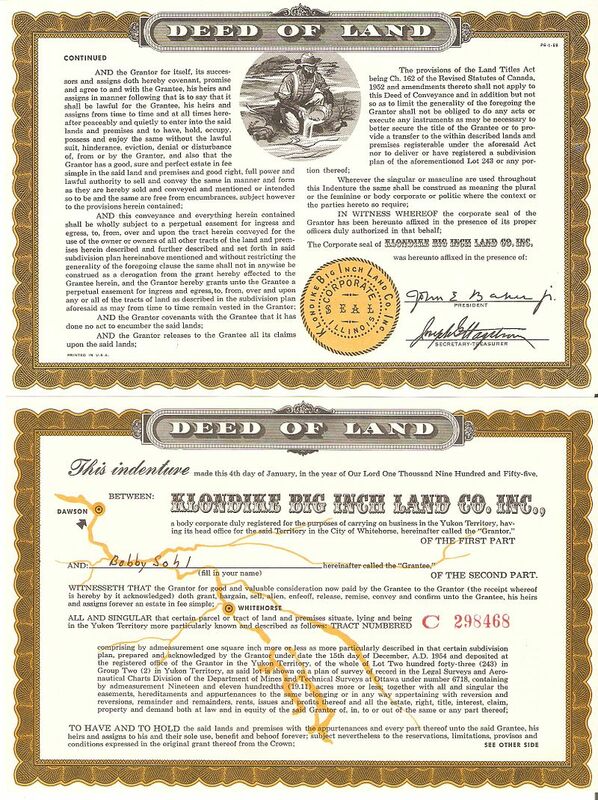 Quaker Oats bought 19 acres of land in the Yukon Territory in Canada for $1,000 and printed-up 21 million deeds for one square inch of land. Then, beginning in January 1955, they ran 93 newspaper ads across the United States that read, “Get a real deed to one square inch of land in the Yukon gold rush country.” The promotion was cross-promoted to the Sergeant Preston of the Yukon radio show, which Quaker Oats was sponsoring at the time. The promotion was very popular, but later ran into a series of legal problems, as you can imagine. I read that for many years these deeds were actively traded with people actually accumulating as much as 10 square feet of land and then traveling to see their “land” way up north. Junk in Space Matters to Us. Man has been going into space for about 60 years and the amount of man-made debris we have deposited there is becoming hazardous to both the people we send up as well as the satellites there. In a podcast called Bigger Little Questions I learned there are over 500,000 man-made objects of all sizes in orbit around earth and about 23,000 of those are sizable enough for Nasa to actually track them. These 500,000 objects vary in size from the International Space Station to little chips of paint. And, while you might not think little chips of paint matter, check out this picture of a Space Station window nearly broken by a quarter inch paint chip traveling at 17,500 miles per hour. Why does any of this matter to you? Because of greater concern is what could happen if two much larger objects like satellites collide. According to research referred to as the Kessler Syndrome and noted in Space Safety Magazine, if two larger objects collide this will generate such a large quantity of debris that this debris would likely then collide with other objects and create even more shrapnel and litter until the entirety of low earth orbit is impassable. More relevant for us – we may lose our cellphones, direct tv, and all the technology on which things like Google Maps and even self-driving cars rely on. And, we will be unable to launch other satellites that would be able to replace them. How Much Fat is Too Much, in our Sewers? Did you know there is a 130 ton fatberg in the London sewer system? (I’ll let you click on the link if you want to see it.) When people dispose of cooking fats and grease down the drains, these fats really do not break down. Over time, these fats encounter each other and bond together. What is really interesting is some of the larger fatbergs are homes to colonies of earthworms and other life forms. Carry Guns, Yes – Carry Signs, No. In Tennessee it is now illegal to carry signs and signs on “hand sticks” into their Legislative Plaza because these objects “represent a serious safety hazard.” However, earlier this year they made it legal for Tennesseans with valid gun permits to bring their weapons into the Legislative Plaza. The world is an amazing and crazy place.